Over the years, LC Interpreting Services has had the unique privilege of providing Sign Language interpreting and other communication services for organizations of every size, and d/Deaf individuals from all walks of life. From our experiences, we’ve come to understand the most common difficulties that businesses encounter when it comes to providing Americans with Disabilities Act (ADA) compliant accessibility and fostering an inclusive workplace. We’ve also witnessed the frustrations that Deaf and Hard of Hearing individuals face when it comes to basic communication access in everyday situations, overcoming cultural stigmas, securing gainful employment, and advancing in their careers. So our sister agency was born! Introducing: Innovative Inclusion, LLC. Innovative Inclusion was created out of our desire to help build more meaningful, productive relationships between professional organizations and their Deaf and Hard of Hearing employees, clients, customers, and the community as a whole. Innovative Inclusion ( See our introduction video on Vimeo here ) is a consulting agency that creates workshops, training programs, and resources for businesses that want to ensure they are meeting their legal obligations under the ADA, providing appropriate and affordable communication options, and maximizing the many benefits of working with the Deaf and Hard of Hearing population. We design actionable diversity and inclusion initiatives that have a lasting impact. Innovative Inclusion’s programs are created in close collaboration with Deaf and Hard of Hearing advisors, and then implemented by qualified Deaf/ HoH trainers and consultants. The result is a groundbreaking set of culturally competent workshops and resources that can be beneficial on their own, or combined to create a comprehensive Deaf Cultural Competency Training Program to meet the specific needs of any business. Our network of experts and reputable resources is continuously expanding, which allows us the unique ability to create new partnerships and innovative opportunities. & More! …Contact us to discuss custom packages. As a community-led organization, Innovative Inclusion places high value on creating new connections. We’re always seeking motivated individuals to add to our growing network. Be sure to subscribe to our newsletter and follow us on social media for the latest updates and information! Also, to keep up to date with ADA compliance and Deaf Advocacy, community, research and trends, check out our blog at www.adacomplianceconsultantfordeaf.com ! July 26 marks the anniversary of the Americans with Disabilities Act: a set of laws established to help people with disabilities gain access to society that was simply not designed for them. 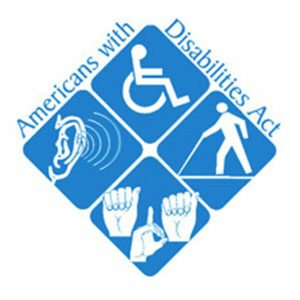 Since 1990, this landmark piece of legislation has improved the lives of millions of Americans by providing clarification regarding their rights to access— whether that means built-in wheelchair ramps, requesting ASL interpreters, or allowing service animals into buildings— and offering legal recourse for individuals whose rights are violated. Make no mistake, the ADA has not miraculously leveled the playing field for those with disabilities. It helped lay the foundation for equal access, but the ADA does not guarantee that services will be available for those who need them when they need them. 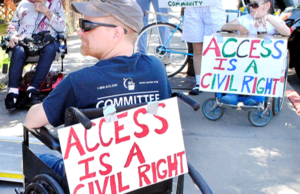 Without the hard work of determined disability rights activists, the ADA would never have been passed; and without ongoing advocacy efforts, little real change might have come from the legislation. People who do not need to reference the ADA on a regular basis to get their basic needs met are frequently unaware of their obligation to ensure equal access to their establishment / service / business. In the years since the ADA became law, people with disabilities have had to consistently perform the labor of educating people about their disabilities and what it means to be disabled in a world that favors able-bodied individuals. They must also be willing to challenge organizations to go beyond bare minimum compliance, which can sometimes mean taking on large institutions in a public way. These are only a few of the thousands of thoughtful explanations and analyses of the ADA and how these legal provisions actually apply to those who are deaf. There are countless hours of video containing firsthand accounts, experiences, successes and failures available on the Internet for those wishing to gain a deeper insight into the longterm impact of the 1990 Act. Overall we have seen quite a bit of progress yet discrimination remains a fact, due in large part to simple ignorance. 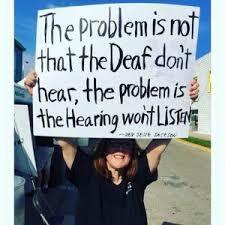 If you are a deaf or hard of hearing individual, it is your responsibility to ensure that your rights are not being violated. Until we live in a world where accessibility is built-in and widely understood, the burden will continue to fall on already disadvantaged minority groups to fight for basic accommodations. Each time a person takes it upon themselves to challenge the institution that oppresses them, they remove a barrier for the next person— no matter how big or small. This incremental progress adds up over time. If your rights are violated, pursue further action. If your needs are not adequately met, provide feedback and pursue further action. The advocacy and awareness that each person spreads works toward creating a more educated society with advanced views of disability. Pushing back is important work! But what about allies? How can people who are not deaf or disabled help, without their position of able-bodied privilege resulting in further oppression? Where to get started? A marketing manager or event coordinator at a company can take it upon themselves to consistently educate about and advocate for inclusive events, emphasizing the importance of providing interpreters and advertising events as deaf-friendly. 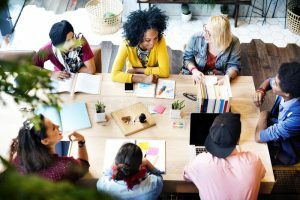 Managers and supervisors on a corporate level can suggest cultural competency training for employees, preferably a program created by and/ or led by people who are deaf. This will help create an understanding of diversity, and can open up new possibilities with deaf clients and customers. Administrators or Human Resource managers can take the time to ensure that their organization has contracts on file with high quality interpreting agencies. 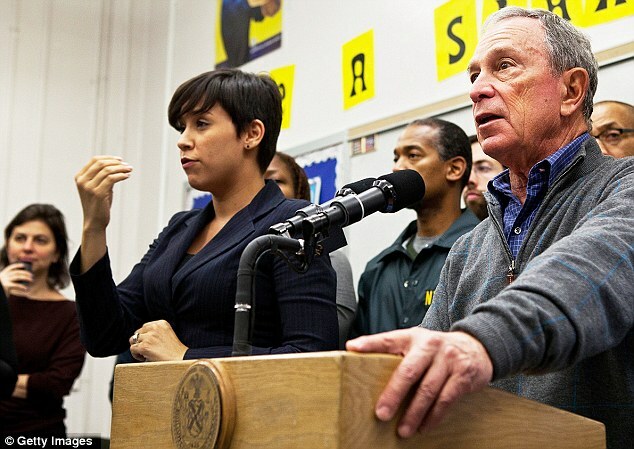 They can work to emphasize the importance of being prepared for deaf individuals to access goods and services as they please. 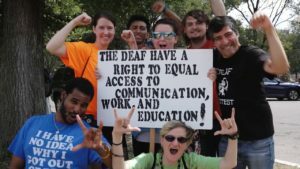 If there are initiatives underway in the community, for example deaf individuals in your area are pushing for captioned showings at theaters, make sure to amplify their concerns and take any actions possible to support their cause. The ADA in action is more of a tool for people with disabilities than any kind of guarantee. This set of legislation only works when it is enforced, and it is up to each member of our society to help enforce it. We must maintain our willingness to challenge comfortable but oppressive social norms in everyday situations. We need to keep pushing for what is right, even when it is the more difficult path. 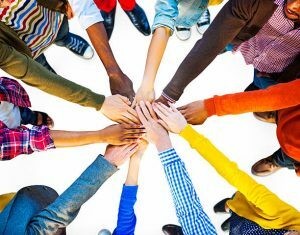 Working together, little by little we can help remove the structural roadblocks that limit individuals, thereby collectively creating a truly diverse America. LCIS is thrilled to partner with Innovative Inclusion, LLC to offer ADA Compliance Consulting for businesses and organizations. The Innovative Inclusion ADA Compliance Consulting program works in conjunction with relevant stakeholders and committee of Deaf advisors to assist organizations with reducing legal risk and ensuring that their business has all the tools for success when working with Deaf/ HoH customers, clients, or employees. Contact us Today for more information!